If it seems as if you’re seeing more high-cost claims in your population each year, you probably are. 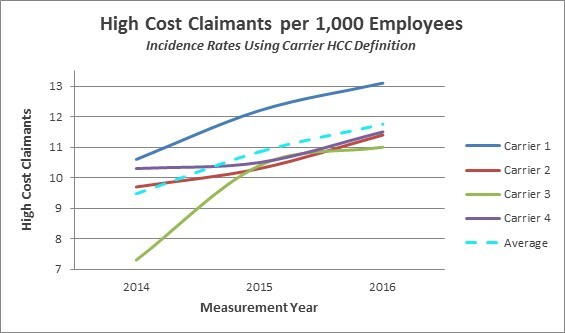 A study of carrier claims data from Mercer Health Advantagesm, (MHA), a program offered through select insurance carriers that features high-intensity care management for employees and covered family members with serious/chronic conditions and acute health needs, reveals that the percentage of claims that were considered “high cost” by the carriers is growing rapidly. While there are different approaches to addressing high-cost claims, enhanced care management programs like MHA are gaining traction because they can improve the experience of employees and family members dealing with serious and multi-faceted medical interventions while also mitigating the cost. When patients receive the right care, delivered in the right place at the right time, outcomes are better and wasteful spending is avoided. Generally, a relatively small number of plan members drive a large portion of the cost. In the MercerFocus database, on average the sickest 6% of an employer’s population accounts for 46% of the total allowed medical and pharmacy spend. High-touch, nurse-centered care coordination can help ensure that the money spent is producing the best possible health outcomes, as cost-efficiently as possible. The important difference between standard health advocacy programs and high-intensity care management programs, such as MHA, is that the nurse care manager works directly with the dedicated care team as well as the patient, and stays in contact after discharge to provide support and improve compliance with treatment plans. These three real-life MHA patient stories illustrate how support from a dedicated healthcare professional can improve outcomes. Better coordinated care A patient in a car accident spent months in a hospital and then a rehab facility. The patient’s nurse care manager helped plan for various care transitions to ensure that the member received the right level of care and progressed in a timely fashion. The nurse care manager and dedicated social worker also helped the family apply for disability and learn more about Medicaid. Better compliance after discharge For a patient who had a hip replacement, the nurse care manager, along with the dedicated pharmacist, discussed pain management – including the important issue of proper medication dosage – and helped schedule follow-up appointments. She also arranged for physical therapy to begin at home. Resource for informed advice Another patient even credits his nurse care manager with saving his life by convincing him – after several heated phone conversations -- that his chest pain (the onset of a heart attack) warranted a trip to the emergency room. His wife had initiated the call when she was unable to persuade her husband that he needed to act quickly. Employers are justified in making high-cost claims a priority. The key is to look at the value derived from those expenditures, not simply cost alone. Value should be the starting point for any employer’s strategic planning and action when it comes to high-cost claimants. Mercer’s proprietary MHA program has been offered to employers since 2013 and continues to show favorable ROI and a positive impact on employees and their family members.